Everywhere you look, a carpenter has been there working his or her magic. 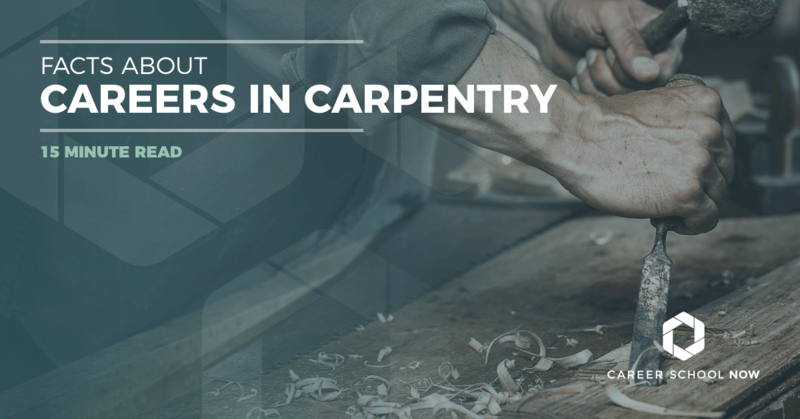 Read on to learn about carpentry and what it takes to become a carpenter. Carpenters create things out of a variety of materials, depending on their area of expertise. They may make beautiful cabinetry or intricate doors. Or, they could construct the entire framework of a building or a bridge. Carpenters are skilled craftsmen and women who work in the construction industry on a variety of levels. A carpenter may install pre-fabricated products, or they could prepare objects from ‘scratch’. Wood isn’t the only material a carpenter works with; they work with steel, fiberglass, plastic, and other building materials. There are a few different types of carpenters: rough, finish, residential, commercial, and industrial. Each type of carpenter has been formally trained and has the appropriate skill set for the part of the industry they work in. Rough Carpenter: Rough carpenters are skilled in following blueprints or oral instructions to create rough structures such as scaffoldings, supports for tunnels and bridges, temporary frame shelters, and billboard structures. Finish Carpenter: Finish carpenters are brought in on the final phase of a variety of projects. The finish carpenter installs the trim work and frames around features such as windows, walls, and staircases. The finish carpenter completes projects that need that last touch to look good and finished. There are a few things that need to be done before you can start a career in carpentry. There are a few necessary personal skills you should have, as well. For example, you should have excellent manual dexterity. In other words, you need to be able to work well with your hands. You should be exceptionally detail-oriented and have impressive problem-solving skills. Things happen, and you need to be able to think quick on your feet to fix them. Your focus and physical strength don’t necessarily need to be your superpowers, but they should be pretty fine-tuned. And, you’ll need to know how to use all those tools that people of the carpentry trade use. Becoming a carpenter sounds fast and easy, doesn’t it? Nope, it’s not. It takes the proper training and lots of hands-on practice. We’ll go into more detail about what you need to do to become a carpenter in the following sections. If you’re still in high school and considering a career in carpentry, enroll in shop class if your school offers it. Also, make sure to take plenty of math classes, including a business math. Drafting and business design are also courses to consider while still in high school. To start your training as a carpenter, you need to be 18 years old and have a high school diploma or GED. You must have proof of US citizenship, be in good physical condition to be able to do the strenuous type work, and you need to be able to pass a substance abuse screening. Once you have those requirements, there are a couple of different options to look at on your road to becoming a carpenter. Apprenticeship Programs: The most typical way carpenters learn the trade is through apprenticeships. Carpenter apprenticeships last 3-4 years and include 144 hours of coursework and 2,000 paid, on-the-job training hours per year. Generally, apprenticeship programs are found through unions and the U.S Department of Labor. Apprenticeships may also be offered through trade schools, as well. And, many carpentry contractors offer apprenticeship positions. Some apprenticeship programs may pay for post-secondary education so that an associate’s or bachelor’s degree can be earned. Post-Secondary Education: Choosing to get a diploma or associate’s degree is not required for carpentry careers, but many do decide to take this route. Expect 1-2 years of school before receiving a diploma or certificate. Most will still have to complete an apprenticeship before becoming a journeyman carpenter. Some apprentices decide to head to school for a degree, and in most instances, much of the apprenticeship education is transferable toward that degree or certificate/diploma. Having an associate’s degree is a great option for those who may want to head off to a four-year college because some college credits have already been earned. You know you want to become a carpenter, but you have no idea which educational path works best for you. There are some questions to think about to help you come to a decision on the best fit for your carpentry school needs. Keep in mind; most post-secondary training will still require you to complete an apprenticeship before you’re eligible to take the exam to become a journeyman carpenter. Do I want a degree or certificate? Does the school offer job placement? Does the school help obtain apprenticeship positions or does the school offer its own apprenticeship program? Will I have to provide my own tools and supplies? How connected is the school to unions and contractors? Do the credit hours go toward the apprenticeship or will it be separate? Will you be working on a construction site or have other real-world carpentry opportunities? Does the coursework include a variety of training in different areas of carpentry? What type of reputation does the school have? What is the success rate of past graduates? The education portion is covered by the costs listed. But, as with most programs, expect additional costs when estimating your out-of-pocket school expense for carpentry programs. If you are attending out-of-state carpentry training, then you’ll need to add the cost of room and board to your list. Plus, you will need to purchase the course materials such as books, tools, and uniforms. All these factors can add anywhere between $500-$20,000 to the cost of carpentry training. Note that apprenticeships allow you to earn a wage that is between 30%-50% of what experienced carpenters make. The more you learn during your apprenticeship, they more you will earn. Many trade schools offer scholarships to put toward education. There are scholarships out there for specific trades, as well as ones for trade school in general. To even be considered for financial aid, it’s important to take the first step and fill out the FAFSA which is the Free Application for Federal Student Aid. Once your FAFSA is completed, and the list of schools you’re interested in have been sent your information, they will help you locate money in the form of grants, scholarships, and loans that you can put toward your carpentry training. Most forms of financial aid can only be received if the school is an accredited program. Please read our article on getting financial aid for more information. Carpentry may be a hands-on type of career, but there is also the business side to it, as well. During carpentry training, the aspiring carpenter will learn the nuts and bolts of carpentry. Included in both the apprenticeship and post-secondary training will be on-the-job training where you’ll be working as a carpenter’s helper. Each school and apprenticeship may offer a variation on the coursework so, depending on where you go for your carpentry training, the basics will vary. The formal training segment of carpentry will include courses such as tool usage and best practices, cabinet-making, installation of drywall, remodeling, roofing, reading blueprints, and residential planning. You will learn building codes, basic math, and safety requirements, as well. Classes will introduce carpentry for residential and industrial buildings in courses such as framing for residential structures and finishing for residential structures, where both steel and wood framing and finishing is taught. You’ll also learn project management and computer technology. The hands-on portion is where you’ll learn how to apply the coursework in a real-life setting. Framing and finishing are large training components that will be worked on. You will use the instruments and tools associated with carpentry, and you’ll learn to work with lumber, drywall, steel, and other construction materials. Some schools will offer onsite hands-on practice where you will actually be part of a building project that the school partnered with. Apprenticeships not only teach you everything about being a carpenter, but you’ll also learn how carpentry relates to other trades in the construction industry which will create a more well-rounded learning experience. Certification within an industry proves to potential employers, as well as clients that you have what it takes (and then some) to get the job done. Carpentry certification gives a sort of insurance that your expertise is up to the industry’s standards for licensed professionals. Carpentry does not have industry-specific requirements when it comes to certifications. There are, however, voluntary ones available. National Association of the Remodeling Industry: The NARI offers a few different certifications for remodelers. There is the Certified Lead Carpenter credential for carpenters who want to head up a project. This requires five years of experience in remodeling, with two of those years being a lead carpenter to be eligible. With many industries heading toward green and sustainable living practices, a good certification to sit for would be the U.S Green Building Council’s LEED Green Associate Exam. The exam fee is $200 and will test you on the current green building practices. Other certifications to consider are CPR and Automated External Defibrillator certifications, training courses to become certified in mold, lead, and other such hazards. Also, a fire and site protection and inspection certification is a good one to have. These additional certifications just add a level of authority to your resume and can give you a leg up on competition. Average job growth for all careers is between five percent to seven percent. Carpentry is going to see a eight percent job growth between now and 2026, which is right in the center of average. Some of the key reasons that are keeping carpentry moving at an average rate are population growth driving the construction of new homes, and home remodeling. Both of which make up the residential building construction where the heaviest job growth in the industry is. Also, as our nation’s buildings, bridges, and other structures age, the need for repair is constant and leads to employment opportunities for skilled carpenters. Another component is the increase in modular, prefabricated, manufactured homes. These structures, while every piece is created in a manufacturing facility, has to be put together on its delivery site, piece by piece, by a carpenter. Job growth for carpenters will look different in every industry and state; same goes with the salary. If you’re in a situation where moving states isn’t a big deal, then finding the best job with the best pay could be a bit easier if you’re a qualified carpenter. Have tools, will travel! Most carpenters work full time, which may include evenings and weekends, depending on the project. Carpenters are no stranger to overtime, either. 1 in 3 were self-employed, allowing more freedom in their work schedule. The average annual salary for carpenters in the United States is $45K. The highest 10 percent, those who have been in the industry for a fair amount of time, earned more than $80K. Entry level carpenters made over $27K. These are only averages so depending on where you live, what type of industry you work in, and your level of experience will be more of a determining factor when it comes to your personal salary. Electric Power Generation, Transmission, and Distrib. Many contractors, including carpenters, choose to join their local related unions. There are quite a few checks in the ‘pros’ column when it comes to joining a union. For example, union workers can only be terminated for a ‘just cause’. This means that there needs to be a REALLY outstanding reason for being fired. Union dues can vary, but the cost of joining a union is offset by the job protection and other positive factors it brings. Union workers earn better wages, have access to better benefits, and better job security. Not to mention, joining a union gives you strength in numbers, and being a union member comes complete with a large number of ‘brothers’ and ‘sisters’ who have your back. The average salary for a union carpenter is over $70,000 which is much higher than the national average. United Brotherhood of Carpenters and Joiners of America: United Brotherhood of Carpenters is the largest union for those in carpentry, with more than a half million members. They have their own state-of-the-art training facility for members where they not only educate new carpenters, but they have conferences and leadership programs, as well. They have contacts and unions in almost every region. Find yours here. In every region, there are different unions to look into. The Pacific Northwest Regional Council of Carpenters is part of the United Brotherhood of Carpenters. The Southwest Regional Council of Carpenters is for carpenters in southern California, Nevada, Arizona, Utah, New Mexico, and Colorado and is ‘home’ to over 44,000 carpenters. Here is a resource to find a union near you: Union Facts for Carpenters. License specifications for carpenters vary by state. Most states DO require some form of license for a carpenter to provide service. Depending on the state, the carpenter may have to pass one of more tests, as well as have a certain amount of documented hours of work experience. Contractor’s License Reference site lists each state and their licensing requirements. If a carpenter is found to be working without a license, they can be penalized with a fine. Some states only have one license for carpenters, while others may have a few that are separated into the type of carpentry instead of the career as a whole. Most construction contractors don't need to be licensed in Illinois. All contractors doing business in counties with a population of 100,000 or more need a license to do business. Nonresident contractors doing business in Nebraska must register with the Nebraska Secretary of State and the Nebraska Department of Revenue. You must register to be in the business of building new homes in New Jersey. You must also warrant each new home you build and provide warranty follow-up services. $75 journeyman's exams and licenses. Licenses are good for three years. To work as a general contractor on projects costing more than $30,000 in North Carolina, you must get a license from the North Carolina Licensing Board for General Contractors. You must have a license in North Dakota to work on any job costing $2,000 or more. You don't have to take an exam to get a contractor's license. But you do have to prove you don't owe any taxes and that you have workers' compensation and liability insurance. Most construction contractors don’t need to be licensed in Ohio. If you build, repair, or remodel one- to four-family dwellings in Rhode Island, you must register with the Contractors' Registration Board. To do residential building over $200 and commercial building over $5,000 in South Carolina you must be licensed. $250 nonrefundable to file your application. License is good for two years. Most construction contractors don’t need to be licensed in Texas. Most construction contractors don’t need to be licensed in Vermont. $150 nonrefundable Class C License.